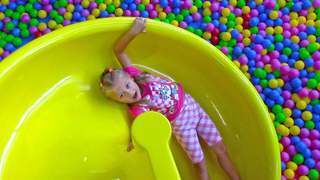 Elli loves the kids playground and this time she jumps a lot in the trampoline area as you can see in this kid blog episode. Listen to the Helicopters Song, Octopus Family and other nursery rhymes while watching her jump and play in the other areas of indoor playground. She also had a lot of fun shopping for a stuffed animal that she gladly took home with her. Watch Elli has fun doing other fun activities by going to Kivitu.com where you can find all her other videos for free.